As parking on Market Street is limited, the researcher should park in the large free parking lot to the rear of the courthouse. The lot is accessed from Willow Alley between the rear of the corner bank and the stone sherriff's office (formerly the county prison). You enter the courthouse via the accessibility ramp on the left rear side of the building. Follow the ramp to the front of the courthouse annex building. Vending machines are found just to the inside right of the far right rear entrance. County commissioners, prothonotary, and register and recorder's offices are all on this floor. Tax Lists for each year. 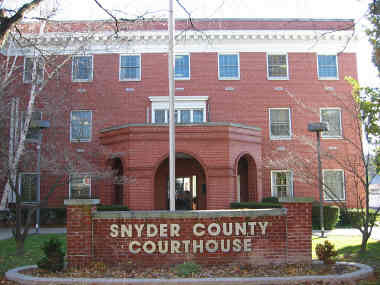 Many of the tax records of Snyder County townships and communities in existence during the Northumberland (1772-1813) and Union County (1813-1855) years have been transferred to this office. However, there are some gaps in the earlier years. Wills and Intestates 1855- Some from 1772 onwards were transferred from Northumberland and Union Counties. 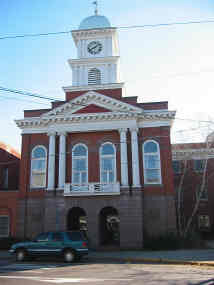 However, the researcher still needs to check the Union County Courthouse in Lewisburg for records 1813 - 1855 and the Northumberland County Courthouse in Sunbury 1772 - 1813 as not all records were transferred to Snyder County.